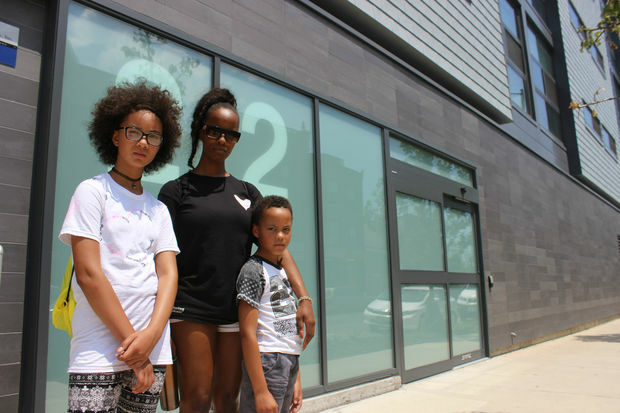 With so few affordable housing units available under the provision, Rameka Aton, 33, and her two children, ages 12 and 7, don't have a good chance of getting into one of the luxury buildings. LOGAN SQUARE — Last spring, Rameka Aton and her children, ages 12 and 7, were desperate to get out of their mold-infested West Town apartment. "I had to throw out half my kids' clothes. Their room was the worst," said Aton, who paid $850 per month to live there. Aton spent months searching for a new place that was both affordable and near her kids' school, Talcott Museum and Fine Arts Academy, 1840 W. Ohio St. But she came up empty. Then the 33-year-old got to talking with 1st Ward Ald. Joe Moreno, who told her she might be a good candidate for an affordable unit in one of the area's new luxury developments under the amended Affordable Requirements Ordinance. With a renewed sense of hope, Aton left the mold-infested apartment, moved in with her mother temporarily and applied for an affordable apartment in the "L" building in Logan Square at 2211 N. Milwaukee Ave.
"I was like, 'Oh yeah, this will be cool. It would be great to live in a nice, new updated building,'" Aton said. But that feeling was short-lived for Aton, whose struggle to land a unit illustrates what critics say is wrong with the program: There are not enough units being built, fostering a fierce competition to win one. Since 2003, developers seeking to build certain multi-family housing have had to designate a percentage of units as "affordable" or pay a fee. In October of 2015, the city made changes to the Affordable Requirements Ordinance, raising the fees for qualifying developers who don't set aside 10 percent of new units. The goal of the legislation, according to co-sponsor Moreno, was to stop developers from "buying out of the ordinance." Two years later, the new rules have applied to 61 developments. But despite the effort, most developers are still choosing to pay millions of dollars rather than set aside units as affordable housing. Just 202 affordable units have been created under the provision so far, which means the city’s on pace to create about 500 units over the course of five years, well below its goal of 1,200 units. So far, developers have paid about $39.4 million in fees since the ordinance passed. The money goes into the Affordable Housing Opportunity Fund, which creates new construction affordable housing and provides rental assistance. When Aton's application was rejected — for both the "L" building and "Luxe on Chicago" at 1838 W. Chicago Ave., which share the same leasing company — she was disappointed. Her income wasn't the problem. She made about $32,600 that year, working for a private bartending company and driving for Uber — in addition to collecting child support for her two kids. In an email shared by Aton with DNAinfo Chicago, the leasing agent wrote her: "We spoke to the developer and it really comes down to your credit score." The leasing agent was looking for a score between 650 and 700, and Aton's fell short of the requirement at 580. Aton said she spent about $1,000 paying down her debt to try and improve her score — all while moving her kids from one couch to another over the course of several months. But the developer wouldn't budge. Neither the leasing agent nor the developer could be reached for comment. "It was really, honestly depressing," she said. Aton's situation is not uncommon under the ordinance, said James Rudyk, Jr., executive director for the Northwest Side Housing Center. "The chances of [Aton] getting a unit is slim to none because there are so few units," Rudyk said. Rudyk said the credit score requirement at the "L" building is not only unfair, but also unrealistic. In his experience, first-time homebuyers are typically required to have a score between 620 and 640. "Going up to 700 makes no sense for someone who's just renting," Rudyk said. "It's a policy that's intended to make certain places unavailable for certain populations." Rudyk said for-profit developments participating in the affordable housing program don’t always cater to the most vulnerable, including people facing homelessness. "Low-income is a broad term. ... Someone who is on disability or may have been homeless, those units aren't for them," Rudyk said of the luxury buildings. "But someone who works at Starbucks that's making $14 an hour ... they could qualify. That's the challenge. Those units are being taken by those individuals." Cornelius Goins had a relatively easy time with the application process. Goins, 67, was living alone in a basement apartment behind his family's home of 50 years when he applied to live in an affordable unit in the "L" building almost a year ago. After working for Strack & Van Til for about a decade and Marshall Field's for 26 years before that, Goins was looking for a bigger place to spend his retirement. "I wanted to find something bigger that I could afford. But in that area, things are really expensive," said Goins, who was getting $1,400 per month in Social Security and making about $560 per month at the grocery store. Goins waited a few months to hear back from the leasing agent. But other than the wait, the process was relatively painless, he said. Goins was able to set up his new place just days after moving out of the basement apartment. "The room is wonderful. The new stainless steel appliances, washer and dryer. All of that is a plus," Goins said. Some affordable housing advocates say Aton is the perfect example of how the ordinance falls short. But others say middle-class people who make more money, like teachers and city workers, are the ones being left out of the equation. Just like any rental applicant, people applying for affordable units must meet a number of requirements, which vary slightly depending on the development. Generally speaking, affordability is based on what seems appropriate for people earning 60 or 80 percent of the average income in a given area. The 2015 ordinance expanded it by allowing eligibility for new sales to people making up to 120 percent of the average income. Robert Buono, developer of Logan Square's MiCa Towers at 2733 W. Belden Ave., said the income requirement is unreasonable. His team has been forced to turn many people down for making too much money, he said. "ARO eligibility, from our perspective, should be expanded to include folks with higher incomes," Buono said. Ald. Moreno agreed, saying, "It's a very small window." "A starting salary teacher and police officer make too much," Moreno said. At community meetings centered on development, Moreno touts that the 1st Ward has added about 100 affordable housing units under the new ordinance, the most of any ward in the city. But Moreno also says that the ordinance needs work. Some of his ideas include increasing the overall percentage of units in designated "areas of opportunity," increasing the number of bedrooms in affordable units so they're more family-friendly, and increasing the income requirement. He also wants to enlist a group of nonprofit organizations to work with potential renters to streamline the application process. "The city should be in the business of making sure it's not abused," Moreno said. The alderman is planning to roll out some of these changes in a pilot program that will be implemented in the 1st Ward and other "opportunity areas." More information on the program will be released in the coming weeks, he said. Demand for affordable housing in Chicago, including Logan Square and the surrounding communities, is "off the charts," according to Lindsey Haines with the nonprofit housing organization Full Circle Communities. Haines said more than 500 people are on a combined waiting list for the Milwaukee Avenue Apartments and the Sawyer SRO, two affordable housing buildings that offer just 66 apartments. Rudyk called the current 10 percent requirement a "joke." "It's not enough. It's good there's 10 percent, but that's nothing," he said. But increasing the required percentage is tricky, as most developers are not even willing to reserve 10 percent of new units as affordable housing. Moreno said he'd rather get 10 percent or 15 percent, which he's been asking of most developers, rather than nothing at all. "So I say to [Goins] ... I know your family bought a house 50 years ago. You work part-time at a grocery store, you're a cancer survivor. I don't want to look up to Corni and say, 'There's not really any units around here because I require 40 percent on site and we don't have any built yet.'" As for Aton, she's found an apartment in West Garfield Park, much farther from her kids' school. While she's looking forward to finally settling back into an apartment of her own, she has fears about the neighborhood, considered one of the West Side's most violent. "I'm someone who is a real advocate for being part of social organizations and trying to enact change. When I ended up being the person who needed help and needed to utilize those resources, it really failed me," she said.